Aspen Pet Antimicrobial Ortho offer pets of any sleeping style the perfect place to catch some z?s. Each bed features a faux suede and micro terry cover for added comfort. Added Microban antimicrobial helps fight the growth of stain and odor-causing bacteria, mold and mildew. Choose from either the gusseted or pillow bed for stretchers or the mini oval for curlers. 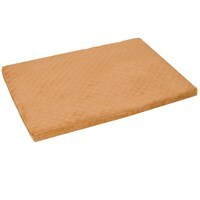 Also available as an orthopedic bed containing convoluted foam and low-profile height, perfect for older dogs or dogs recovering from surgery.